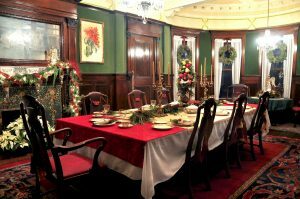 Kick off your holiday season with a tour of the elegantly decorated Ellwood mansion. More than a dozen rooms will be decorated by local businesses, clubs, organizations, and volunteers. Self-guided tours will be available during the holiday event weekend November 30 through December 2. During the holiday event weekend, tour guides will be stationed throughout the house to share the history of the home. Other weekend highlights include live music, visits with Santa, and refreshments. Friday, November 30: 6:00 p.m. – 9:00 p.m.
Saturday, December 1: 1:00 p.m. – 5:00 p.m.
Sunday, December 2: 1:00 p.m. – 5:00 p.m.
No advanced purchase is required for the holiday event weekend, however tickets will be available online starting November 1 for those who prefer to skip the line in the Visitor Center and proceed directly to the front door of the mansion. Admittance to the mansion will end 30 minutes before closing.